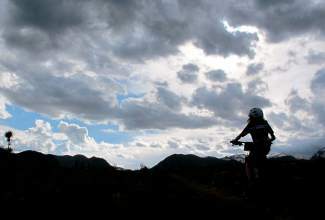 A young cyclists powers up a hill climb on the Frisco Peninsula trails during the 2014 Frisco Roundup mountain bike race. Day-of registration at 4 p.m. Juniors racing kicks off at 5:15 p.m., followed by adults at 5:30 p.m. The post-race part at Backcountry Brewery in Frisco is $10 and includes pasta buffet, garlic bread, salad and two free beers. All series races are held on Wednesdays, with categories for children, adults and singlespeed cyclists. Entry fees vary from race to race. A series pass (good for all races) is $170 until June 17. A series pass without The Fall Classic is $125 until June 17. For more info, including course maps and registration details, see www.mavsports.com. For local mountain bike fanatics, summer might as well begin at the starting line of the Frisco Roundup. The Roundup, an early-season race over the spider-webbed trails at the Frisco Peninsula, starts today around 4 p.m. with registration at the Frisco Adventure Park. There are categories for men and women, juniors and veterans, single-speed masochists and never-ever beginners — just about anyone who enjoys a mid-week break from the everyday grind. This season’s Roundup route doesn’t hold many surprises, even for folks who have been away from the series for a while. Westcott likes to keep things familiar: From the adventure park starting line, adult and youth cyclists pump up the paved bike path to the maintenance yard parking lot before taking a hard left onto M’Rezy, the first of the peninsula’s relatively mellow singletrack. From there, the race follows different courses for different categories, ranging from a 4.4-mile course over Crown Point Road and Buzzsaw for juniors to a 19.8-mile trek across Balfonz Blitz, Jody’s Loop, Riechel’s Retreat and Buzzsaw for adults. All courses are clearly marked and end with one hell of a ride through the green flow line at the adventure park. But, are the trails dry after a wet and dreary May? Have no fear, Westcott says — Frisco is pitch-perfect for early in the season because it tends to dry out quicker than neighboring trails, even when Mother Nature won’t cooperate. Prime conditions and fun, flowy trails make it a popular stop for cyclists from Denver, Golden and neighboring mountain towns like Salida. Upwards of 200 people are expected to compete. But, don’t let the crowded start list scare you off. There’s plenty more to come: The Roundup is the first of seven races in the beloved Summit Mountain Challenge, a summer-long race series spread across more than a hundred miles of local singletrack. Like the series itself, the Roundup is something of Summit County institution. It’s been around for 29 years — as long as the series — and makes for a relatively low-key introduction to Summit biking. Breck resident Kevin Shelden is one of the Roundup faithful. He may have missed the race last year — sometimes, work gets in the way of a midweek race series — but he’ll be on the Peninsula today, racing in the Expert 40-49 category. Like Westcott, he can’t think of a better venue to start the racing season. Shelden also enjoys the community aspect. The Roundup is where his eldest son, 28-year-old Taylor Shelden, started racing nearly 15 years ago. Taylor is now a professional road cyclist who lives in Denver; but, in keeping with tradition, he’ll drive up today for a few laps around the Peninsula with his dad, mom and younger brother, 21-year-old Tanner. The series as a whole is a stellar way for newcomers to get their first taste of bona fide racing. Today is the first of more than a dozen summer races for the 11 members of The Cycle Effect, a nonprofit that pairs in-need students with high-level cyclists. And here’s the rub: The Cycle Effect is for girls only — Summit County middle and high schoolers. Jaime Brede, head coach and program director for the Summit County branch (there’s another in Eagle County), has been working weekly with her team since early March, prepping their legs, lungs and nerves for a summer of cycling. Brede won’t join her team on the Roundup course — she’s busy training for the Ultimate Mountain Challenge at this weekend’s GoPro Mountain Games in Vail — but she’ll be at the finish line to cheer them on. With the exception of two veterans, junior Aurora Lopez and just-graduated senior Mikaela Martinez, none of the girls have raced before. Brede knows they’re nervous, but she also knows it only takes one race — and one finish — to boost confidence.